After you have invested time and money into a beautiful glass shower door from Superior Shower Doors, the last thing you want is for hard water stains to mar your upscale look. Preventing hard water stains in your shower is relatively easy, but often goes overlooked. 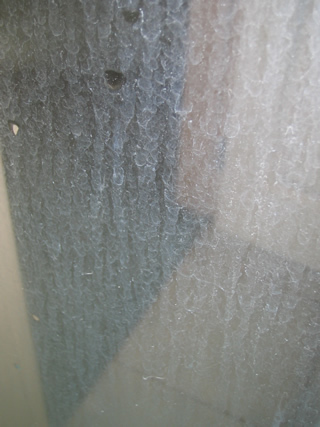 Once a shower door is covered in hard water stains, it’s difficult if not impossible to make them look brand new again. You can remove residue from hard water, of course, but that residue also damages the glass by etching it. You can’t reverse that. Fortunately, there are several ways to protect your shower from hard water stains. The simplest way to prevent hard water stains is to be sure you’re cleaning your shower door and walls on a daily basis. For example, keep a cheap squeegee stored in your shower. Use it after every shower to pull the water from the glass door and walls. This eliminates any chance of hard water stains forming. Alternatively, you can achieve the same effect by wiping down your shower door and walls with a microfiber towel after each shower. If you feel the towel becoming too wet as you wipe, simply wring it out and keep going. A third way to keep your shower clean on a daily basis is by spraying it down with a daily shower cleaner, which you can purchase at your local grocery store and stash in the shower. With any of these options, however, it’s important you remember to maintain your shower each day. Otherwise, hard water stains will quickly crop up. Century Clean and Seal. This product is a cleaner and a sealant all in one. As it cleans, Century leaves an invisible barrier that will protect your shower door from hard water stains. CleanX Invisible Shield Glass and Surface Coating. CleanX says this product will provide protection to glass surfaces for up to six months. Like Century’s product, it both cleans and protects, keeping your shower door looking brand new, even if you have to deal with hard water in your home. Proactively cleaning and protecting your shower door is the best way to keep it looking new. However, if you’re dealing with hard water stains and residue that have already built up, you may want a way to remove them without harsh chemical cleaners, which can potentially cause even more damage to the glass. Over the years, people have developed a variety of handy home remedies for coping with hard water and removing stains. Water and vinegar. This one is incredibly simple. Just mix a solution that’s half water and half white vinegar in an empty spray bottle. Then spray the solution on your shower door and let it sit for a few minutes. Wipe it clean and your hard water stains are gone. Baking soda and vinegar. Adding baking soda to a homemade cleaning mixture can help with hard water stains that have really built up and will take more elbow grease to remove. Make a paste using baking soda and white vinegar, then spread the paste over your hard water stains and let it sit for about 15 minutes. Rinse with water and be sure to wipe it dry. Lemon juice. Many people don’t realize the lemon juice sitting in their refrigerators makes a great cleaner. Simply spray lemon juice on your shower door and let it sit for 10 minutes or so, then wipe clean. Alcohol, water, tea tree oil. You can put 2/3 of a cup of rubbing alcohol into a spray bottle, add a couple of cups of water, and 15 or 20 drops of tea tree oil. Shake and spray after every shower. It prevents buildup and leaves your bathroom smelling clean. If you are running low on time and energy for keeping your shower clean, you can always look into hiring a maid service. Often these cleaning professionals can get your shower door looking like new again, and can offer you some tips or “secret solutions” for cleaning it yourself. Even if you hire a service just once to get a good deep clean and some do-it-yourself pointers, you can hire the same service back once or twice a year to help keep your shower – not to mention your entire home – clean and sparkling.